Chinese invention patent: CN101638442-A CN101235095-A (Aug., 2008); ZL200710141265.3 (June, 2013) (GRANTED). US patent#: 8268126 (Issue date: 09/18/2012). 2. A Magnetic Solid Catalyst and Its Applications (in lignocellulose hydrolysis). Chinese invention patent: ZL201010243359.3, May 2012 (GRANTED). 3. A High-efficient and Energy-saving Device for Lignocellulosic Biomass Hydrolysis. Chinese invention patent#: ZL201020562302.5, Jan. 2011 (GRANTED). 4. A Reactor System for Ethanol Production, Chinese invention patent, ZL200920253718.6, June 2010 (GRANTED). 5. A Novel Method (by Using Solid Base Catalyst) for Hydrolysis of Lignocellulosic Biomass. Chinese invention patent: CN101638441-A (Feb, 2010); ZL200910094892.5 (April, 2011) (GRANTED). 6. A Novel Method (by Using Solid Acid Catalyst) for Hydrolysis of Lignocellulosic Biomass. Chinese invention patent: CN101638442-A (Feb, 2010); ZL200910094893.X (April, 2011) (GRANTED). 7. A Novel Process for Continuous Extraction of Curcin from Jatropha Seeds. Chinese invention patent: CN101463073-A (June 2009); ZL200910094015.8, Aug. 2011 (GRANTED). 8. A Continuous Reactor for Bio-Diesel Production. Chinese patent: ZL200820081793.4, July 2009 (GRANTED). 9. 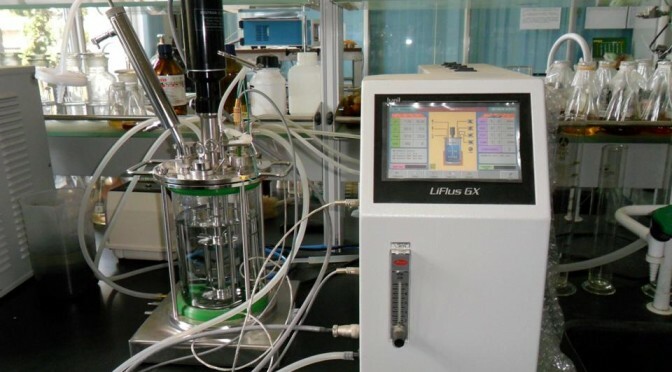 A Method and Equipment to Continuously Produce Bio-Diesel from Jatropha Oil. Chinese invention patent: CN101381613-A (March 11, 2009); ZL200810058974.X, Aug. 2011 (GRANTED). 10. A High Pressure and High Temperature Flow Reactor for the Production of Biofuels. Chinese patent (utility model): ZL201320359907.8, Dec. 2013 (GRANTED). 11. An Autoclave Used for Separation and Recovery of Magnetic Catalysts for Biofuels Production. Chinese patent (utility model): ZL201220038727.5, Sep. 2012 (GRANTED). 12. A Magnetic Solid Catalyst (CaFe2O4) and Its Applications. Chinese invention patent: CN102513000-A (June, 2012); ZL201110334924.1 (August, 2013). (GRANTED). 13. A Method to Pretreat and Hydrolyze Microcrystalline Cellulose. Chinese invention patent: CN102382870-A (March, 2012); ZL201110227943.4 (May, 2013). (GRANTED). 14. A Method for the Production of Biodiesel Catalyzed by Solid Acid Derived from Lignin. Chinese invention patent: CN102188995-A (Sep. 2011); ZL201110080225.9, March 2013 (GRANTED). 15. Method for the dissolving and rapid hydrolyzing of lignocellulosic biomass, device thereof and use of the same. Chinese invention patent: CN101974161-A (Feb. 2011); ZL201010297515.4, Oct. 2012 (GRANTED). International PCT invention patent, PCT/CN2011/001099, US patent#: 9243303 (Issue date: 01/26/2016). 16. A Micro Reactor for the Hydrolysis and Liquefaction of Biomass.Chinese patent (utility model): ZL201320359823.4, Dec. 2013 (GRANTED). 17. A Method to Produce 5-Hydroxymethylfurfural by Solid Acid Catalysts.Chinese invention patent: CN102399201-A (April, 2012); ZL201110376665.9 (April, 2014). (GRANTED). 18. A Continuous Flow Reactor for the Production of Soluble Sugars and Biodiesel. Chinese patent (utility model): ZL201420785283.0, (June, 2015). (GRANTED). 19. A Method to Synthesize Mesoporous Activated Biochars. Chinese invention patent, ZL201310331615.8, (June, 2015). (GRANTED). 20. Method of Completely Dissolving and Rapidly Hydrolyzing Cellulose, and Uses of Said Method. International PCT invention patent, PCT/CN2010/001253 (2010). US patent#: 9115215 (Issue date: 08/25/2015). 21. A Carbon-based Magnetic Solid Base Catalyst and Its Applications. Chinese invention patent: ZL201410764721.X (Sep. 2016), (GRANTED). 22. A Circular Tubular Reactor for Counter-flow Catalytic Reactions with Magnetic Catalysts. Chinese patent (utility model): ZL201620978132.6 (March 2017). (GRANTED). 1. Zhen Fang*, R. L. Smith, Jr., XF Tian (Editors), Production of Materials from Sustainable Biomass Resources, Springer Book Series – Biofuels and Biorefineries, Springer-Verlag, Heidelberg Berlin, hardcover, ISBN 978-981-13-3767-3, 12 Chapters, 2019. 2. Zhen Fang*, R. L. Smith, Jr., H. Li (Editors), Production of Biofuels and Chemicals with Bifunctional Catalysts, Springer Book Series – Biofuels and Biorefineries, Springer-Verlag, Heidelberg Berlin, hardcover, 12 Chapters, ISBN978-981-10-5136-4, 2017. (4.8k chapter downloads, Jan. 2019). 3. Zhen Fang*, R. L. Smith, Jr., X. Qi (Editors), Production of Platform Chemicals from Sustainable Resources, Springer Book Series – Biofuels and Biorefineries, Springer-Verlag, Heidelberg Berlin, hardcover, 14 Chapters, ISBN 978-981-10-4171-6, 500 pages, 2017. (Among the top 25% most downloaded eBooks in 2017; 11.3k chapter downloads, Jan. 2019). 4. Zhen Fang*, R. L. Smith, Jr.(Editors), Production of Biofuels and Chemicals from Lignin, Springer Book Series – Biofuels and Biorefineries, Springer-Verlag, Heidelberg Berlin, hardcover, ISBN 978-981-10-1964-7, 2016. (Among the top 50% most downloaded eBooks in 2016; 17.6k chapter downloads, Jan. 2019). 5. Zhen Fang*, R. L. Smith, Jr., X. Qi (Editors), Production of Hydrogen from Renewable Resources, Springer Book Series – Biofuels and Biorefineries, Springer-Verlag, Heidelberg Berlin, ISBN 978-94-017-7329-4, hardcover, 430 pages, 2015. (12.1k chapter downloads, Jan. 2019). 6. Zhen Fang*, R. L. Smith, Jr., X. Qi (Editors), Production of Biofuels and Chemicals with Microwave, Springer Book Series – Springer Book Series – Biofuels and Biorefineries, Springer-Verlag, Heidelberg Berlin, ISBN 978-94-017-9611-8, hardcover, 300 pages, 2015. (18k chapter downloads, Jan. 2019). 7. Zhen Fang*, R. L. Smith, Jr., X. Qi (Editors), Production of Biofuels and Chemicals with Ultrasound, Springer Book Series – Springer Book Series – Biofuels and Biorefineries, Springer-Verlag, Heidelberg Berlin, ISBN 978-94-017-9623-1, hardcover, 415 pages, 2015. (16k chapter downloads, Jan. 2019). 8. 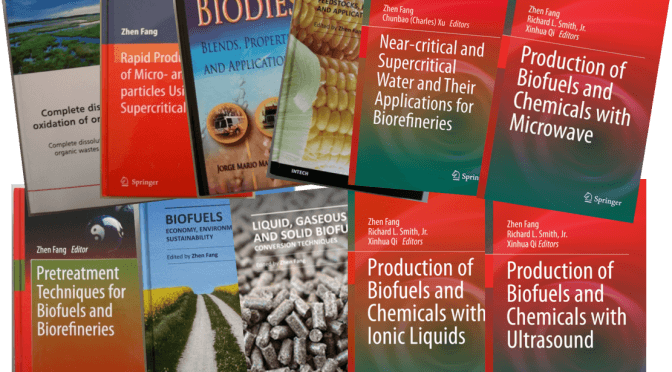 Zhen Fang*, C. Xu (Editors), Near-critical and Supercritical Water and Their Applications for Biorefineries, Springer Book Series – Biofuels and Biorefineries, Springer-Verlag, Heidelberg Berlin, ISBN 978-94-017-8922-6, hardcover, 520 pages, 2014. (17.6k chapter downloads, Jan. 2019). 9. Zhen Fang*, R. L. Smith, Jr., X. Qi (Editors), Production of Biofuels and Chemicals with Ionic Liquids, Springer Book Series – Biofuels and Biorefineries, Springer-Verlag, Heidelberg Berlin, ISBN 978-94-007-7710-1, hardcover, 353 pages, 2014. (20.5k chapter downloads, Jan. 2019). 10. Zhen Fang (Editor), Liquid, Gaseous and Solid Biofuels – Conversion Techniques, InTech – Open Access, ISBN 978-953-51-1050-7, hardcover, 541 pages, 2013. (43.4k chapter downloads, Jan. 2019). 11. Zhen Fang (Editor), Biofuels – Economy, Environment and Sustainability, InTech – Open Access, ISBN 978-953-51-0950-1, hardcover, 386 pages, 2013. (25.4k chapter downloads, Jan. 2019). 12. Zhen Fang (Editor), Pretreatment Techniques for Biofuels and Biorefineries, Springer-Verlag, Berlin Heidelberg, ISBN 978-3-642-32734-6, hardcover, 476 pages, 2013. (Among the top 25% most downloaded eBooks in 2013; 39.7k chapter downloads, Jan. 2019). 13. 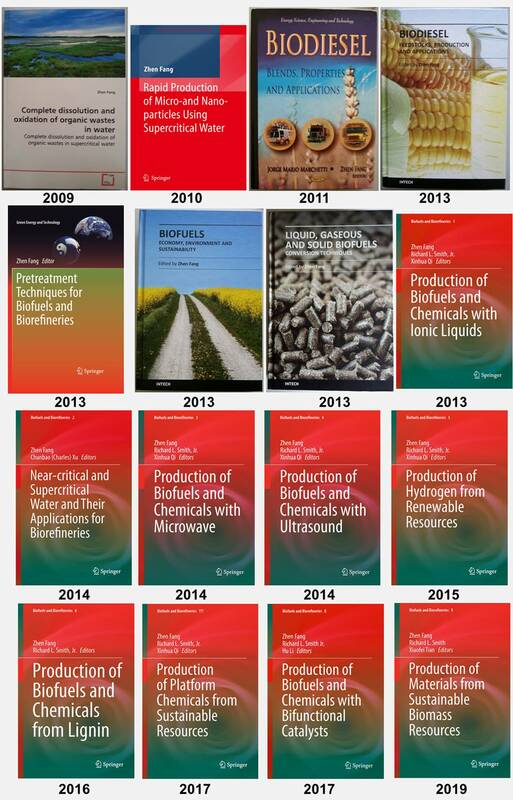 Zhen Fang (Editor), Biodiesel – Feedstocks, Production and Applications, InTech – Open Access, ISBN 978-953-51-0910-5, hardcover, 487 pages, 2013. (39.2k chapter downloads, Jan. 2019). 14. J. M. Marchetti, Zhen Fang (Editors), Biodiesel: Blends, Properties and Applications (Hardback). New York: Nova Science Publishers, Inc., ISBN 13: 9781613246603 ISBN 10: 1613246609, 379 pages, Sep. 2011. 15. Zhen Fang (Author), Rapid Production of Micro- and Nano-particles Using Supercritical Water, Springer-Verlag, Berlin Heidelberg, ISBN: 978-3-642-12986-5, hardcover, 120 pages, 2010. (4.5k chapter downloads, Jan. 2019). 16. Zhen Fang (Author), Complete Dissolution and Oxidation of Organic Wastes in Water, VDM Verlag Dr. Müller, Saarbrücken, Germany, ISBN: 9783639144246, paperback, 192 pages, April 2009. 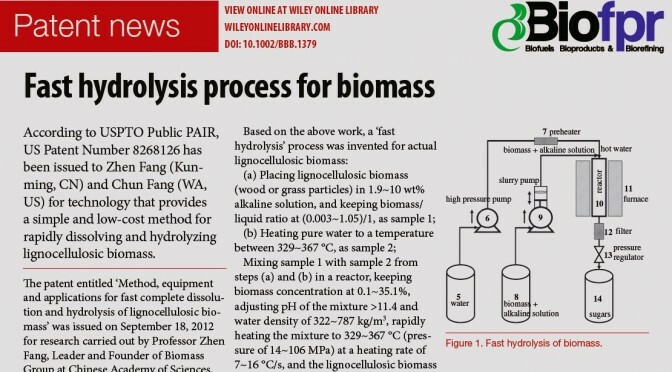 The patent is the latest development in a 23-year effort by Professor Zhen Fang in the study of biomass hydrolysis process, aimed at a simple, fast and low-cost method for a novel biorefi nery. ‘Fast hydrolysis’ process will be the technological key to economic utilization of abundant lignocellulosic biomass as viable feedstocks for the production of industrial sugar, ethanol and chemicals. His pioneering work opens the door to the possibility of developing industrial-scale technology at competitive costs for producing biofuels and valueadded products from lignocellulosic biomass based on the ‘fast hydrolysis’ process in a flow reactor.